Deondre McNeill, a second-year center and undecided student, shoots on Joe Chase, a first-year guard and physical therapist student. AACC’s Men’s Basketball lost the Division III District Championships this season, but they are keeping high spirits in anticipation for next season. The Riverhawks, who ended the season with an 11-16 record, finished off their playoff run with a 88-76 loss against Sandhills Community College from Pinehurst, North Carolina, for the NJCAA District VII Championships. Deondre McNeill, a second-year undecided student and center, said the team came out with a slow start against Sandhills Community College in the District Championship game and couldn’t recover. McNeill said while the team needs to improve on offense and moving without the ball, its defense was the strongest aspect during the season. He added the team performed particularly well in their first playoff game in the Division III Region Tournament against Butler County Community College. In the Riverhawks’ second playoff game in the Division III Region Tournament, the Riverhawks lost to Prince George’s Community College with a final score of 68-73. Walter Tolliver, a second-year health and exercise student and point guard, said the Region Championship game against Prince George’s Community College was his favorite game of the season. 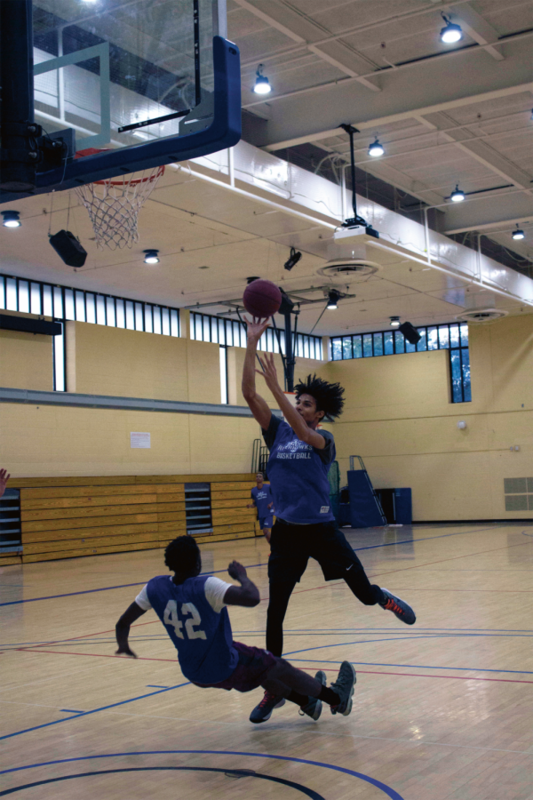 Dayvon Cuffey, a second-year criminal justice student and shooting guard, said despite him and his teammates meeting for the first time in summer leagues he felt they all had a close bond like they had known each other longer. McNeill and Tolliver agreed their teammates are all “brothers” which made the team more successful throughout the season. Toliver also said he admires his teammates for staying positive during the season. While Cuffey said he will not be returning next season because he is transferring to a four-year university, he feels the team could work on their drive for wins next season. Tolliver also said him and his teammates need to work on coming out pumped up and ready to play for every game. He said the team struggled in games after going down by a couple points in the beginning and because they picked up their momentum too late. Cuffey said his favorite game of the season was the regular season game against Baltimore County Community College because he dunked on an opponent during the game. On the other hand, McNeill said his favorite game of the season was the Sophomore Saturday day game against Northern Virginia Community College on Feb. 9. This game was the Riverhawks last home game of the season and it recognized the five second-year Men’s Basketball players. While the Riverhawks fell four points short to the Northern Virginia Community College Nighthawks on Sophomore Saturday, McNeill said it was his best game of the season.